At a meeting in Jerusalem with Israeli Prime Minister Benjamin Netanyahu, Prime Minister Josaia Voreqe Bainimarama has discussed ways to deepen bilateral ties between Fiji and Israel, particularly in advancing agricultural cooperation. During the meeting, Prime Minister Bainimarama reaffirmed Fiji’s commitment to UN Peacekeeping efforts in the region and thanked the Israeli Government for assisting with rebuilding efforts on the island of Ovalau in the wake of category 5 Cyclone Winston. The meeting covered the proposed Memorandum of Understanding (MOU) between Fiji and Israel on agriculture. Given the impact of Cyclone Winston, the two men explored the inclusion of more tailored approaches to crop production and farming practices that are better suited to the changing weather conditions caused by climate change. Prime Minister Bainimarama also extended an invitation to Prime Minister Netanyahu to visit Fiji. 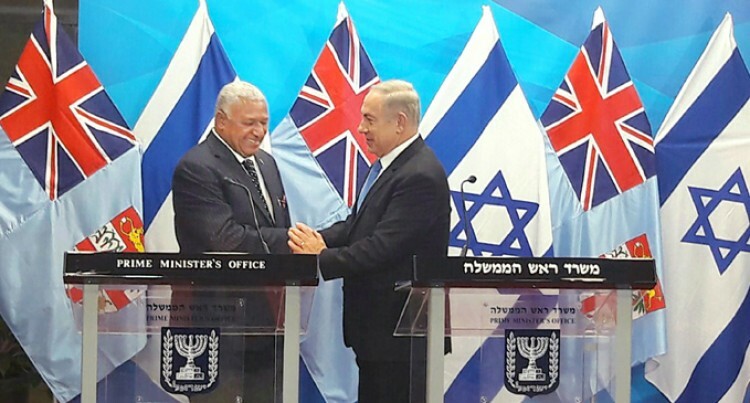 Prime Minister Bainimarama’s meeting with Prime Minister Netanyahu was a part of a three-day visit to Israel. He will go on to Lebanon where he will meet with his Lebanese counterpart and visit with Fijian UN Peacekeepers, prior to attending the 2016 United Nations Climate Change Conference (COP22) in Marrakesh, Morocco.